Looks like quite the weather out the window. Hope you stay cozy and warm as the storm goes through. A lovely vignette of life. I hope the phone call was good. So am I, Andrea, but that is many months away yet. That was last weekend. More next week, AC. Lots of snow due next week, Celia. Sometimes they are not but such is life. We are very fortunate. 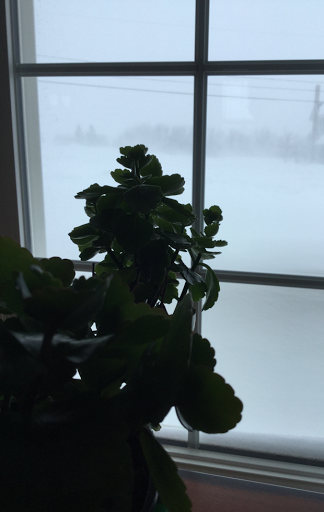 Looks blustery, The little plant (Christmas Cacrus?) is probably happy to be inside and warm. Always ready with the blanket and book, SUI. Thank you, Jan. I look forwad to your posts too. That plant is a kalanchoe I think, SS. What mystery! Who knows what that phone call brings? Are you ready for it? As ready as we can be, FG. Sounds like a great plan to me. I can enjoy life so much more when I know I'm as ready as I can be. And I like my day to follow it's little pattern except when I choose to add some bling to life. We are like the motto, be prepared, Barbara.